A few weeks ago Tamara Sloper Harding, Chairperson of the Pittwater Friends of Soibada, shared a photograph of an amazing quilt on display at Government House, seen during the Investiture of her OAM. The quilt is individual blocks of poppies, made by 11 ladies, and 'Dedicated to our Sons Killed in Afghanistan during Operation Slipper - 2002 to 2014' with 'Gone too Early, Remembered Always' placed under this. There are 16 blocks comprising the rows of this quilt, including one 'In memory of our sons succumbed to the effects of PTSD' and one entitled 'Dove of Peace'. Jan-Maree stated after the April Investiture, "I really have no words to describe how this feels but I need to emphasise that I share this with all of you who make Aussie Heroes possible because though I may be the "leader" for want of a better way of putting it, I alone could achieve nothing without the team." "There are three main reasons I feel the need to do something to give back to our Defence Force. I started Aussie Heroes for a number of reasons – I hated the way our Vietnam Veterans were treated. That can never be allowed to happen again. I heard of an Aussie soldier being given a quilt by the Americans in Germany and was ashamed that there was not an Aussie Quilt for him. He now has one of ours and I have since met him and his wife a couple of times and they tell me that he uses his quilt all the time. Finally, I just felt that we, the Aussie public, needed a way to say thank you to our Defence members for their service. 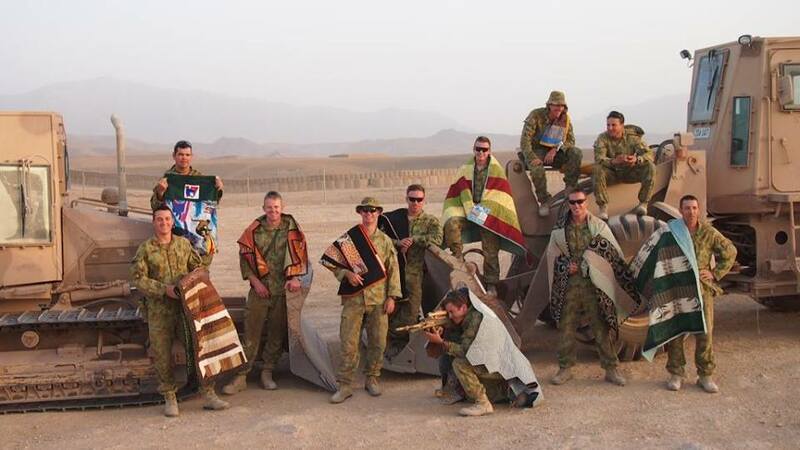 Aussie Heroes has been up and running since January 2012 but it began with me sending quilts and laundry bags, with the help of my quilt group, to one particular soldier and his team in late 2011. I came across this fellow through his wife's blog and reached out to them to see if there was something I could to make his deployment a bit easier. He felt a really useful gift would be a laundry bag. Sounds like such a little thing doesn't it? Well not so. You see the serving personnel were all using the same laundry bags an that made it hard to find their own laundry bag in a hurry when they wanted it. Apparently emails go around each day saying “someone picked up my laundry bag”. This soldier's wife made her husband a colourful one with large initials and the problem was solved for him.....but what of his men? So, Laundry Bags it was. I convinced my quilt group, to come on board and we decided to make 15 very durable laundry bags in time for Christmas! It was already the third week in October. As it gets down to -25ºC in Afghanistan in winter we also decided to make quilts. I designed a very basic strip quilt and we got cutting and sewing and ended up making 24 quilts. All the parcels were sent off in November 2011. The laundry bags and 15 of the quilts went to the Warrant Officer and his team and the extra quilts were passed on to others at the Warrant Officer’s discretion. We received such a heart warming response to the first lot of quilts that we set about sending a few more to friends of those that received the first lot as well as to any other soldiers we heard about. By the end of December it was obvious to me that there was enough support out there to turn this into an Australia wide proposition. On January 1st I launched the dedicated blog aussieheroquilts.blogspot.com.au and after much thought and a lot of supportive comments I decided to launch a Facebook page as well. Aussie Hero Quilts (and Laundry Bags) has continued to grow steadily. By the end of February 2014 we had sent nearly 2500 quilts and over 3900 laundry bags." As of April 15th, 2016, Aussie Heroes Quilts has sent 930 laundry bags for this year, bringing their total for these to 8750 since the initiative started, and 454 quilts have been sent, bringing the total for these to over 5699 quilts. These go to places such as Afghanistan, Dubai, South Sudan, and Egypt or meet RAN ships at docks around the world. I am currently deployed on HMAS Darwin to the Middle East. First and foremost thank you so very much for the Sydney Roosters laundry bag that you made for me. I am so truly grateful for the time and effort that you have put into it. It is absolutely fantastic. I’m sure your husband would have thought it was brilliant also being a Roosters supporter. He must have been happy with the win last weekend also, broke their unfortunate start to the season. I am very impressed that you have been supporting AHQ for four years. I guarantee in that time you have made some sailors, soldiers and airmen very happy and brightened up their deployments. I'm the extremely lucky recipient of one of your beautiful quilts and laundry bags. I don't know where to begin; I cannot thank you enough. I love both items and they are perfect, you're an exceptionally talented person and the goodies have made me very popular already! I'm sure you hear it often but I can't express what these packages and your efforts do for morale. I've been away from home for 7 months now, and recently received the news that I've been extended for 4 months so safe to say my morale took a bit of a hit, but receiving your package today and post card have picked me right back up again. Thank you - it's folks like you that are the true 'Aussie Heroes' and your generosity and efforts enable us to keep doing what we do over here. Thank you very much for the quilt you made for me. I absolutely love it. The red poppy adds a very special touch to it. It came at a time where I was feeling a bit down as I had been talking to my family and listening to some of the issues at home. So, your quilt cheered me up. You made me jealous though talking about your daily walks on the beach. I live in Brisbane and enjoy getting out and about in my boat fishing. I will admit I am not a very good fisherman, normally just feed the fish and my wife tends to laugh at me every time I go out and come back with nothing. However it is something I am looking forward to when I get back. Good afternoon Sue N, I am currently deployed on HMAS Darwin to the Middle East. First and foremost thank you so very much for the Sydney Roosters quilt that you made for me. I am so truly grateful for the time and effort that you have put into it. I couldn't have asked for anything more, it is absolutely magnificent. I am 33 years old, married and have two children; rascally Master 5 and very independent Miss 8. My family live in XXXX with me currently living in Sydney by myself while posted to HMAS Darwin. This will be until mid year when we return and I move back to my family. We have a very regal and spoilt cat, a trouble making Pug puppy and my faithful, but grumpy old Pug x Jack Russell. I have been in the Navy for 15 years and have completed several deployments over this time. This is the first time that I have received a quilt from Aussie Hero Quilts though. I am a Petty Officer Chef and my primary role onboard HMAS Darwin is Catering Manager. It’s a constant job onboard however catering for over 200 sailors four times a day is very rewarding. The beauty of our particular job is that there is always something to do, so we always have something to occupy our minds. We are now half way through our deployment and starting to look forward to returning home. The downhill run can often seem to take longer then the uphill climb, but with a count down to hugs from loved ones, the crew will make it through. The younger sailors and those on their first deployment often struggle with the second half a little bit more as the time away from home increases. This is where those of us that are more experienced step in and reassure them and help get them through it. We are constantly busy with our operation up here, so this helps occupy everyone. Again I thank you for the quilt and for your thoughts while we are deployed. My brother is currently serving in XXXXX. I received a photo and email from him with a beautiful bag that had been made for him. His wife has now advised that you made the bag. On behalf of our family I just wanted to say thank you. It is people like you who make such a big difference. Whilst others are concerned with making money, watching TV and themselves, you are doing selfless acts like this. Firstly thank you so much for the kind gift, the laundry bag is unreal. I couldn't believe how good it looks, it's without a doubt the best one onboard HMAS Darwin, it's honestly good enough to take to an AFL match and use it as a flag. Sorry I'm only getting back to you now as the deployment has been very busy. The trip is going well, long at times as you can imagine it has it's up and downs. We have been to some awesome ports around the world Including, Thailand (Pattaya), Indonesia (Jakarta), India (Visknapatnam) for the Indian Fleet Review, Bahrain (Manama) and Oman (Muscat ) with many more to follow, they are all amazing places. Finally all of the people involved in Aussie Hero's do a fantastic job. When the ship pulls along side a foreign port and we get packages from all around Australia from Aussie Hero's the morale within the mess decks with no doubt rises. To have people back home thinking about us and appreciating the sacrifice we make to serve our country makes it all worth while. Without the support you all provide us this job wouldn't be worth it. Thank you again for the time and effort you put in making the laundry bag it made my day/ week, it will be with me forever. Some of you, like us, will have a few tears in your eyes after reading these. After you have wiped them away - there's something you can do - contribute - let's look after those who are still here and still serving all over the world as much as honour those who have served 100 years ago - you can be sure they would want us to! As you can tell, the creators can make something personal for an individual and not all are football centered - if you scroll through the Aussie Hero Quilts Facebook page you will see all sorts of wonders for every kind of job there is in our Defence Services, although clearly all codes of footy are popular with some who are far from home at this time of year. Once again you can contact me for the name of a specific recipient and make something according to their preferences or you can make what you like and let me know when you are ready to post and I will give you a name. You could join the block of the month (BOM) program and sew up some blocks. The link to the latest block is on the LHS of the blog. Buy a Spotlight Card - you can send Spotlight cards to me and I can pass them on to others who I know can use them. Or you can email me and ask me who to send it to - assuming you don't know of someone in your area. Yesterday was the much awaited presentation of the Centenary of ANZAC Quilt to the Australian War Memorial. A small group of quilters were able to come along and be there when it was presented. I was delighted that Garry and Katrina Robinson also drove down from Sydney for the day. For those of you who do not know Garry's story (you can check it out here). He is one of the reasons I was motivated to start Aussie Heroes. It was really lovely for me to meet Major General Craig Orme, whose quilt and laundry bag I had made myself, and who I had had some contact with whilst he was deployed. "Thoughts I had occur to me later after what MAJGEN Orme said, are that even the friends of AHQ probably underestimate the significance of what the bags and quilts mean to those who receive them. It is after all, as the General said, a gift of thanks from someone who does not even know the recipient, to let them know people at home in Australia care for them. What we do makes it easier for those serving overseas to be feeling like they are making a difference and they are appreciated for what they do. As AHQ Friends we are doing something practical to support the operations overseas." For a number of years Aussie Hero Quilts have provided quilts and laundry bags to Australian Defence Force personnel serving on operations. To recognise this, the volunteers from Aussie Hero Quilts were requested to create a quilt to commemorate the Centenary of ANZAC. To enable formal recognition of Aussie Hero Quilts, the Commanders of Joint Task Force 633 and Joint Task Force 636 facilitated a tour of this ANZAC Centenary Quilt through the Middle East and Afghanistan Regions on individual operational missions prior to gifting the quilt to the Australian War Memorial. 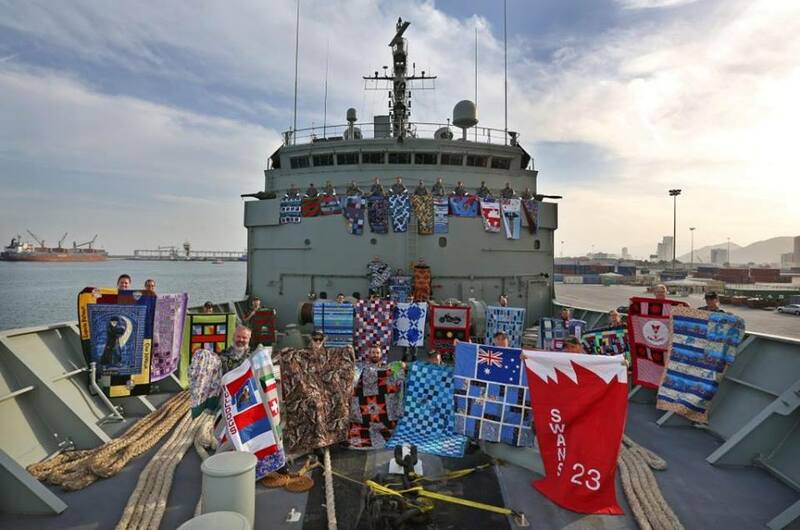 This tour focussed on demonstrating the appreciation and respect that all Australian Defence Force personnel have for Aussie Hero Quilts and provides an historical record of the people behind the operational missions in the Middle East and Afghanistan during this significant year. The ANZAC Centenary Quilt was specially made by Aussie Hero Quilts to commemorate the 100th anniversary of the landing at Gallipoli. Over a three month period, 93 volunteers from around Australia contributed to the creation of this quilt. There are 75 poppies featured, sixty on the front and fifteen on the back; each one individually made. The quilt was made from retired ADF uniforms worn on operations. Appliquéd silhouettes represent the three armed services. The ship, HMAS Newcastle, represents all the vessels and personnel that have deployed on Operation Manitou. The soldier silhouette represents all past and present deployed Army personnel. This silhouette is derived from a photograph of Sergeant Garry Robinson, a 2ND Commando Regiment Wounded Warrior who provided the inspiration for Jan-Maree Ball's foundation of Aussie Hero Quilts in 2012. The C-130 aircraft, the workhorse of the Middle East, represents all past and present deployed Air Force personnel. In this Centenary Year of ANZAC it is important that we reflect and remember all those Australian men and women who served on operations, some of whom paid the supreme sacrifice. It is also very important that we recognise the people; both families and volunteers, at home in Australia who stand in support of deployed serving Australian Defence Force personnel. Volunteer organisations such as Aussie Hero Quilts are often silent partners in contributing to the morale and welfare of our men and women. The ANZAC Centenary Quilt’s tour through twelve missions in the Middle East and Afghanistan Regions and its gifting to the Australian War Memorial is intended as a timeless symbol of our appreciation for this and other volunteer organisations. And is was signed by Rear Admiral Trevor Jones, AO, CSC and Major General David Mulhall, AM CSC. In 2014 the RSL Women's Auxiliaries and sub Branches 'Lest We Forget Quilt' was made, raffled and raised $37, 032.77 to hand to DefenceCare. This project, initiated by the New South Wales RSL Women's Auxiliaries in 2013, and given the name “The Lest We Forget Quilt”; was simple blocks, 10.5 inches square finished and depicting various aspects of Australian Forces involvement in all military campaigns over the last 100 years. 48 Blocks were required to produce the quilt, and the response was overwhelming, the Women's Auxiliary receiving enough blocks to make 8 quilts and 2 Cushions! The seven other quilts; “We Will Remember Them”; this quilt will be going into the Australian War Memorial in 2016, the “ Gallipoli Journey Quilt” ; this quilt will be displayed in the ANZAC Hyde Park Memorial, from 2016, the "They Shall not Grow Old “ War Vets quilt, which has been given to and will be hung at the War Veterans Village at Narrabeen, the “Age shall not Weary them “ will be hung in the offices of the Central Council of Women's Auxiliaries (CCWA), the “At the going down of the Sun “ is scheduled to be raffled at the New South Wales RSL Women's Auxiliaries Congress in 2016, the “And a glory that shines upon our tears “ quilt, first prize quilt at the 2015 Congress 2015, and the “To the end to end they remain “ quilt, which was second prize at the 2015 Congress 2015. Creating quilts for those far from home or to Honour and Commemorate those who have served in conflicts and the events surrounding these is something that dates back to the American civil war, as seen in the 1867 Reconciliation Quilt. Another worth tracking down is that begun in 1995 by Legacy's Executive Committee, who wished to find a unique way to mark the Torch Bearers’ 50th anniversary in 1996. All Legacy groups wanted to participate so an Anniversary Quilt was agreed upon. Every Torch Bearer Group throughout NSW and Queensland were invited to submit a square depicting their area. The 54 squares in this quilt included four containing the names of the Central Executive Committee members and three with the names of various Torch Bearer Groups. The squares, which feature cross and long stitch, embroidery, quilting, appliqué and painting, show industries, cultural, geographical and historical aspects, flora and fauna. Another current example are the Camden Country Quilters who make beautiful quilts for our homeless Australian Veterans. For those who are outraged that our some of returning Veterans are experiencing homelessness, please visit the Homes for Heroes, founded by RSL LifeCare as the Contemporary Veterans Homelessness and Assistance Program (Homes for Heroes) at Narrabeen, and either participate in the inaugural Honour Our Heroes Relay Walk at Parramatta on May 1st or make a donation. Construction Squadron recipients in Tarin Kowt - 2013.